Author Talk: Under the Trestle with Ron Peterson Jr. The Christiansburg Library presents an Author Talk with "Under the Trestle" with author Ron Peterson Jr. on Saturday, February 23, 2019. 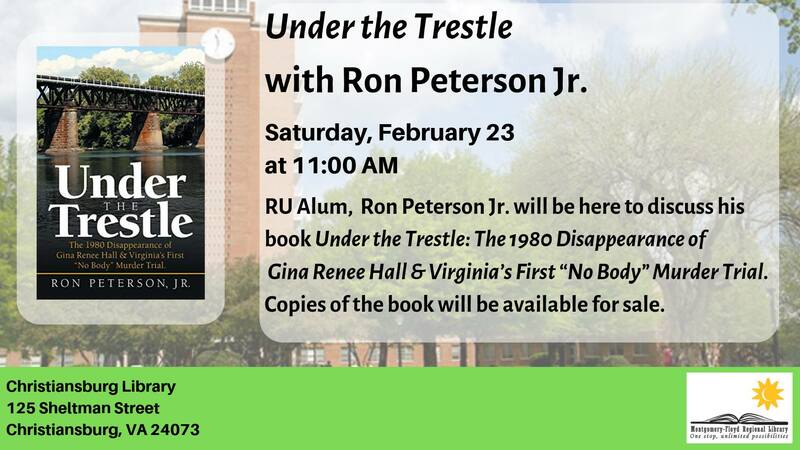 Ron Peterson Jr., author and Radford University alum, will be here to discuss his book "Under the Trestle: The 1980 Disappearance of Gina Renee Hall & Virginia’s First “No Body” Murder Trial". Author Ron Peterson, Jr. attended Radford University and was a communications major and is the author of the book "Under the Trestle". He has been published in newspapers throughout the state and in internal publications for two Fortune 500 companies. His career includes work at the Virginian Pilot and Cox Media, where he earned the company's annual "Outstanding Performance" award. Peterson's background also includes managing corporate television advertising campaigns on CNN, Fox News and ESPN. He is currently a board member of the Hampton Roads Sports Media Hall of Fame. To view the event flyer, visit: https://i.imgur.com/RZdNGPw.jpg. For more information, visit: http://www.montgomery-floyd.lib.va.us/ or https://www.facebook.com/pages/Christiansburg-Library-Montgomery-Floyd-Regional-Library-System-Va/343472325300 or call 540-382-6965.